To meet the requirements od a production order the user can either visually look at the order to see if it can be built by looking at the colored indicators. Green – on the top item means that all components or sub-assemblies are available to proceed. Yellow – means that this production order can be built but at least one component is over-committed elsewhere. Once built other orders may now be short. Red – tells the user that one or more components are not available. In company settings/Inventory if “Prohibit overshipping” is checked, then the user cannot build. *It is not recommended that the company allows over shipping of inventory as the cost that will be used in production will not be accurate. When a PO is received for an item that was negative and the cost was different, the difference will be posted to the cost of goods account for that item. 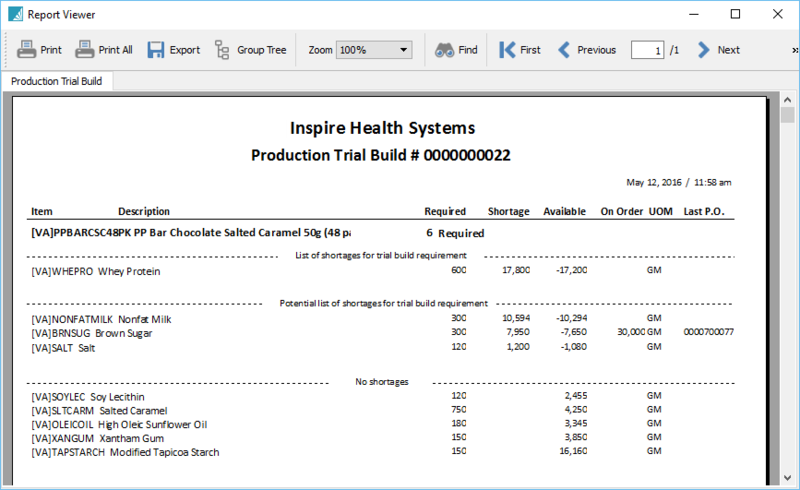 To get a printed version of shortages, click on the print icon and select “Production Trial Build” report. Once a production order has been scheduled the company would normally print a ‘Production Order’ also know as a traveler.